Harmonia ja hyvinvointi. Rauhaa ja rentoutumista. Eleganssin ja yksinkertaisuus. Villa ympäröi 400 neliön puutarha ja yksityinen pysäköintipaikka sisällä aidattu omaisuutta. Villa koostuu kahden hengen huone, wc ja bidee makuuhuone, makuuhuone kerrossänky ja mukava vuodesohva, iso suihkuhuone ja bidee, valoisa muuraus keittiö, ruokailutila ja iso olohuone, oleskelutilassa siellä on vuodesohva. Villa on hyvin kirkas ansiosta suuret ikkunat ja terassit talon, ja hyvin tuore, kiitos aukkojen puolelta, jotka tekevät siitä hyvin tuuletettu. Villa voi majoittaa jopa 6 henkilöä. Talo on myös suuri talvella pysyy, koska se on lämmitysjärjestelmä ja takka. Ulkopuolella on 2 isoa suihkua, terassi, jossa on sohvia, aurinkotuoleja ja nojatuolit, suuri ulkoiluun patio, keittiö ja grilli. Meidän villa on noin 600 metrin päässä merestä, jossa se vuorottelee rannalla hiekalla tai kiviä, sopii lapsille, kallioisella rannikolla ja kiviä. Kylä San Nicola, merenrantakylä, on vain 300 metrin jalka. 5 minuutin ajomatkan päässä kylässä San Nicola L'Arena, kuuluisa merenrantakohteessa hyvin varustettu rantoja. San Nicola l'Arena on ravintoloita, pizzerioita, baareja, jotka valmistavat suuria jäätelöä, että voit nauttia kävelemässä rannalla, supermarketit, apteekki, pankkiautomaatit. Klo pieni satama kylän Pyhän Nikolauksen varhain aamulla voi ostaa tuoretta kalaa suoraan kalastajan vene. Vain 2 minuutin päässä on juna-asemalta ja 5 minuutin kävelymatkan päässä tulet kuuluisa turisti satama purjehdus ja moottorivene, jossa voit vuokrata veneitä tai pomppulinnat tai kiinnittyä omalla veneellä. Sijainti on ihanteellinen, suuri monimutkainen merenranta ja kulttuurimatkailu, 30 km Palermo, Monreale 20 km, 45 km Cefalu. Niille, jotka haluavat paitsi rentoutua, mutta myös vierailla mielenkiintoisimmista paikoista Länsi-Sisiliassa. Pääset Falcone ja Borsellino lentokentälle noin 50 minuuttia, ja noin tunnin ja puoli kaksi tuntia, Segesta, Castellammare / Scopello, San Vito Capo, Erice ja Marsala. Ystäville vuoren voit vierailla kuuluisan Madonia vuoret keskiaikainen kylien Castelbuono, Polizzi, Petralia ja Gangi. Kuuluisa Liparisaarille vain 'tunnin lautalla Cefalu' (25 km). Die 5 Tage waren sehr angenehm, da die Lage sehr ruhig ist und die Ausstattung sowie die der Garten einfach super durchdacht sind. Ein kleiner mediterraner Traum. Einziges kleines Manko: Lage direkt neben den Bahngleisen. Man gewöhnt sich aber Recht schnell an den kurzen Krach. Nachts fährt kein Zug. We spent 10 days in Sara's wonderful house. Sara and her family gave us a warm welcome. Sara was very flexible regarding check-in and check-out time which we appreciated a lot. The house has several beautiful outdoor sitting areas, an outdoor kitchen and a nice outdoor shower. We liked swimming at Vetrana beach and visited Palermo by train. San Nicola is a small village in walking distance. We can highly recommend the house for vacation. Great villa with beautiful garden and view on the sea! We had a wonderful time at this property in July. We stayed there with our 3 small children and the house is ideal for families. It has a spacious living and dining room, open kitchen, nice bedrooms (one with bunk beds for the kids), toys for the kids, most necessary appliances and a very nice outdoor area with garden, veranda, outside shower and kitchen. The house is also very well located between Palermo and Cefalu with easy access to the main motorways to Agrigento, Trapani or Messina. Lots of nice towns and sites to visit in the area. The better beaches are a short drive away, some restaurants in the local town and others in Palermo and Cefalu of course. The owner Sarah is very kind and welcoming, she showed us around upon arrival, made sure we had everything we needed (including baby bed and high chair for our little one) and even went grocery shopping for us on our first day when we arrived tired on a Sunday afternoon. All in all a great place to be recommended to anyone that wants to explore Sicily! Hello Marc and family, you have been a model guest and I am very happy to have met you. I did little but to make you feel very comfortable at home, I like to pamper you. I hope to see you again soon. 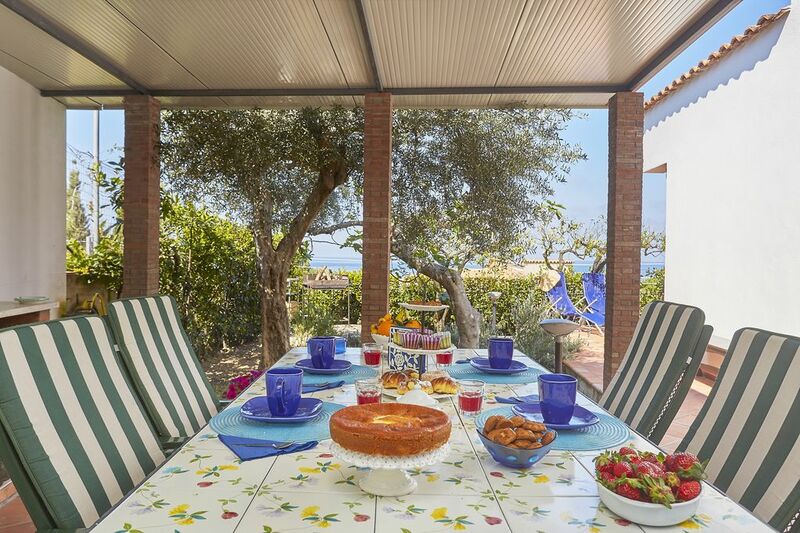 This property is an excellent and comfortable base to explore Palermo, Cefalu and beyond. Sara is keen to make her guests feel welcomed. Her little touches of detail throughout the property add to its appeal. The property is well-equipped and clearly well looked after by Sara. We used both kitchens, inside and out and loved the fact that there were different places in the garden and patio areas to sit and relax. We also found garden herbs and used them too! The property’s location make it easy to wander down to the small town for provisions, a drink or a meal. It is also well-placed for a train ride to Palermo- far easier than navigating the traffic to be sure,- and as you may well wish to visit more than once, this is desirable. Journeys to Monreale and Cefalu are within distance too. Certainly, the property is near, but not in sight of the rail track, but this did not pose a problem for us. This was an ideal base to visit the north of Sicily and a comfortable one, too. We had a fatastic week in Sara's lovely house. Sara met us at the house and was very welcoming, showing us around and explaining how things worked, she even provided us with some local produce. The house is beautifully decorated and was equipped with everything we needed for our weeks stay. The gardens are well maintained with various sitting areas to make the most of the great weather, to allow us to enjoy outdoor dining, there was even a sea view while using the bbq. The house is in a great location for exploring Sicily, and is very close to the major road network. We managed to tour the north and west of the island and if we'd had more time I'm sure we could have gone further east. The house is within 5 minutes walk of the village centre which has an array of restaurants, bars and small supermarkets. We visited various restaurants and enjoyed local fresh seafood, served by friendly and helpful staff. Overall our holiday experience was fantastic, and the house is possibly the nicest we have stayed in, thank you Sara for a lovely holiday. Thanks Steve and Sue for your compliments. I hope that you will soon return to Sicily to Palermo to be able to visit all that you have not yet seen, and I will be happy to accommodate you. Le jardin est magnifique. Dans la maison il ne manque rien.Il y a de nombreux petits coins pour se reposer. La propriétaire est trés gentille et accueillante. Des oranges et des fraises nous accueillaient en signe de bienvenue ainsi qu'un plat sicilien ! Christian et Nathalie, ils sont un couple charmant. J'ai vraiment aimé bavarder avec vous, Nathalie parle très bien en italien. J'espère que vous reviendrez bientôt à Palerme, et je serai très heureux de vous accueillir à nouveau.